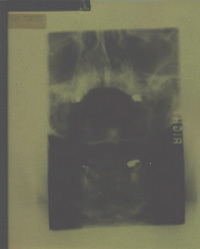 X-Ray Number 1 Published 1993 and limited to an edition of 100 copies. No lettered copies. Front cover made of actual x-rays. Contributors include Charles Bukowski, E.F. Kohler, Paul Weinman, Geof Huth, Joolee Peezlee, Dave Girtsman, Chuck Sperry, Mike Boul E. James Armstrong, Delia Shargel among others. Fun Facts: No. 1 Received Editors Choice in Factsheet Five. The original price was $7.00.